And so October draws to an end. It's been a very full and busy month, with so much happening which hasn't made it into blogposts: the start of the new academic year here in Oxford, weird weather, storms and gales elsewhere, new initiatives, meetings and wrestling with technology. 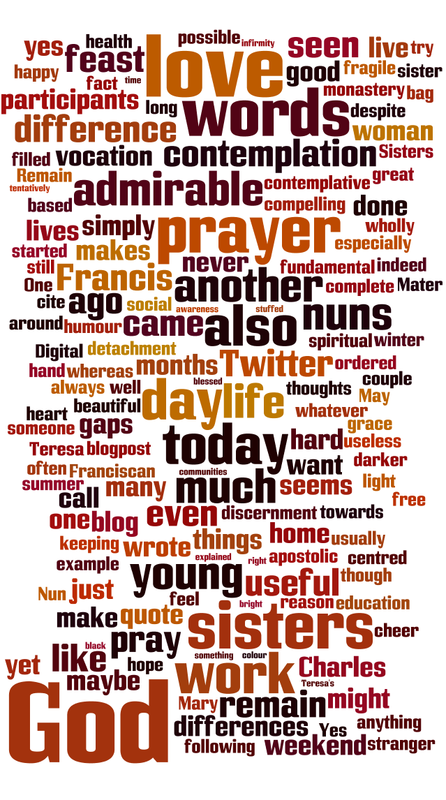 And in the blogposts themselves, some special feasts - Francis, Teresa and Mater Admirabilis - and musings on the call to religious life, people, vocations ministry and the onset of autumn. In fact, a couple of weeks ago I wrote that the trees had not yet put on their bright autumn colours. Since then, various russets and golds have been slowly seeping into the greens and splashing their fieriness against pale stone walls. Yes, it is definitely autumn, though still relatively mild and light, so there's no sense yet of autumnal gloom. Winter is coming, oh yes, but not just yet!